If you're hunting around online for "skull boys pajamas", chances are you're actually searching for the Skurvy pajamas that are consistently featured by Small Paul. Dressing your kids with style became a whole lot easier when designer Paul Frank decided to start marketing children's apparel under the label "Small Paul". 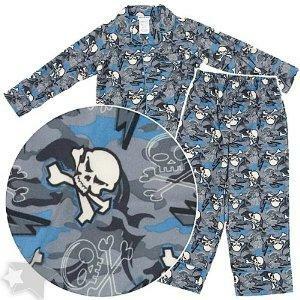 Though many people might think it strange that parents are actively seeking out pajamas with skulls on them, the Small Paul skull boys pajamas are anything but frightening. The Skurvy logo is just another one of Paul Smith's signature characters. Though the Small Paul line was initially popularized by Julius the monkey, Skurvy's cartoonish skull appeal has many contemporary parents, as well as children, fascinated. Never before has a skull and crossbones logo been so appealing. Hence, when your child starts pleading for Small Paul Skurvy apparel, you don't need to be timid regarding the cute plucky-looking skull logo. Paul Frank has succeeded commendably in transforming this piratey symbol into a child's plaything. Once you've translated your search into "Skurvy Boys Pajamas" you will likely have an easier time finding what you're looking for. Fortunately, Small Paul pajamas are very popular, and if an item is sold out on the official Paul Frank website, you won't necessarily suffer a hard time finding it elsewhere. Still, your first place to look for Skurvy pajamas will be the Paul Frank site, specifically under the "Shop" division where you can easily distinguish between adult, child, and infant sizes. If you are wary of online shopping, or you simply don't know which size would be preferable for you child, Small Paul clothing is now enjoying wide distribution in the United States. Large chains like Target have picked up the label and are selling a slightly lower quality version of the line which, for the most part, equates to lower prices. JCPenney also deals in Small Paul clothing, but the higher end versions of this line can be found at department stores such as Nordstrom. During any given season the styles of Small Paul Skurvy pajamas will vary from flannel button-up styles to regular two-piece thermals. Summer time yields short styles and all of the aforementioned pajamas will feature that irresistible Skurvy logo, the one your child can't stop talking about. However, in some cases Small Paul has gone above and beyond mere trends of fashion, as is the case with their flame retardant flannel pajamas. Though these PJs are difficult to find out of season, you have to congratulate Paul Frank for being prepared. One might wonder why pajamas would need to be flame retardant in the first place, but really, isn't safety a sufficient reason? Next time your son is roasting marshmallows at night around a campfire, you won't have to worry should his pj bottom catch the flame of a stray cinder. Nevertheless, the real reason you'll be buying your son his Small Paul skull pajamas is because they are delightfully stylish. Paul Frank is a trend that just won't die. Bright colors, cute minimalist patterns, simple clothing designs, and a slight affiliation with extreme sports enthusiasts, Paul Frank is now adorning everything from babies to iPhones. When your child dons his Paul Frank pajamas he becomes a nod to the times, and though some parents think of following fashion trends as succumbing to the "herd mentality", other parents recognize this surrender as simply adding something fun to their child's wardrobe. Ultimately, most parents want their children to be happy and aptly dressed at sleepovers. Occasionally this will mean decking out your progeny in flirty skull apparel, but at least you will have done so at reasonable prices. Thanks to Small Paul for popularizing skull prints, at any given time there will be at least one brand featuring skulls on their pajamas. Although skulls aren't typically an adornment of children's apparel, occasionally other brands manage to glorify the fearsome quality of skulls in a tasteful manner. Joe Boxer has been known to embellish its boys' apparel, including pajamas, with skulls. MaxandMaude's is another retailer that carries more progressively-printed pajama styles. If your desire for skull-laden pajamas is due to a gothic persuasion, then you can keep an eye out for these items at websites such as DarksideClothing. Though boys' pajamas are not regularly stocked items, these sites do provide gothic children's clothes that often feature skulls. It's really only a matter of time before sleepwear makes a debut within their inventories and, as skulls become more iconic, you can be sure that many more designers will incorporate this print into their clothing lines.